Nando’s seems to be Britain’s favourite restaurant. Cult-like devotion among its customers keeps them coming back and the reasonable prices keep them happy so no wonder Britain’s entrepreneurs want to get in on the act. 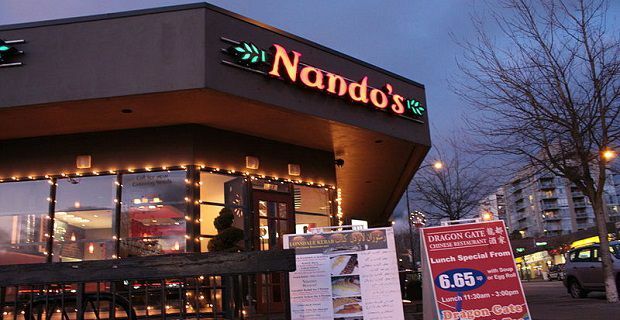 There’s no information on the Nandos franchise cost for the UK simply because the restaurant chain that originated from South Africa doesn’t offer franchising to UK businessmen and women. The average meal in Nando’s, perhaps something like a quarter chicken with two sides (rice, chips or coleslaw) and a drink (with endless refills) costs something like £9.00. This isn’t the sort of place to take someone on a first date if you’re trying to impress, but it’s ideal for a first date when you’re trying to be casual and fun. Nando’s isn’t a fast food chain like McDonald’s but you get your food swiftly and they like to keep the customers moving to make table space for new ones. The term for this type of business is “fast casual”. A “fast casual” restaurant typically has short menus and offers pretty healthy food which is freshly prepared. The chicken served at Nando’s isn’t free range but it’s delivered fresh rather than frozen and the chickens are farmed in the UK. There are close to 1,000 Nando’s in 30 countries at this time. A quick check of nandos.co.uk shows that they are only open to franchisees in South Africa, New Zealand and Australia. They don’t operate franchises in the UK or Ireland and they have no plans to do so. The current British operation is run by a private equity company that is owned by a wealthy South African family who invested in the SA business. The first two branches opened in 1992 in Ealing and Earl’s Court, west London. Both of them served mainly takeaway food. When they changed their business model to “mixed service”, which basically means they the customer’s allocated a table, orders at a counter and collects their own cutlery before waited to be served their food, the business took off.